Nothing against these pitchers (especially Miles Mikolas, who had a good but perhaps unsustainable 2018 when looking at xFIP and SIERA, which he at least parlayed into a big contract extension), but these aren’t names that come to mind first when you think of the top pitchers in the league, and Garrett Richards isn’t usually on the mound to move up into that category in the first place. This isn’t a great endorsement for Musgrove, so why am I interested in him? I drafted Musgrove in both of my fantasy baseball drafts earlier this month, prioritizing him over the other names in the above table. I did this based on the work of Nick Pollack, founder of the great website Pitcher List and contributor to FanGraphs, who has talked up Musgrove for awhile now. On the now- famous Top 100 Starting Pitcher Rankings featured on Pitcher List, Musgrove ranks 44th, ahead of the previously mentioned Archer (54), Alex Wood (69), Marco Gonzales (77), and other notable pitchers such as Cole Hamels (47), Jon Lester (48), and Dallas Keuchel (73). There must be an explanation for this. On Musgrove’s FanGraphs player page, Pollack writes that his 4.7% walk rate in 2018 was no fluke and that he features an offering of secondary pitches that could easily push his strikeout rate to a much better 25%. I always have an interest in low-walk-rate starting pitchers, but one with an above-average strikeout rate? Now I’m interested. Richards’ limited sample is featured again, but overall this looks like a better tier of pitcher than in the previous table. While not featuring the truly elite tier of pitchers, this group had an average 2018 fWAR of 3.12 (excluding Richards), a number that would rank 23rd among starting pitchers from 2018. The key takeaway from this table is that Musgrove’s two biggest strikeout pitches, the slider and changeup, not only generate dominant strikeout and whiff rates, but also that according to xwOBA (expected weighted-on base-average), the pitches underperformed. He only threw these pitches about a third of the time combined, and his best strikeout pitch (the changeup) less than 15% of the time. It appears from this table that by changing up the pitch allocation and throwing the offspeed and breaking ball more than his platter of fastballs, turning into a true three-pitch pitcher, Musgrove could get his overall strikeout rate up. While just throwing these pitches more often doesn’t guarantee an increased strikeout rate, it does look like it’s worth a shot. 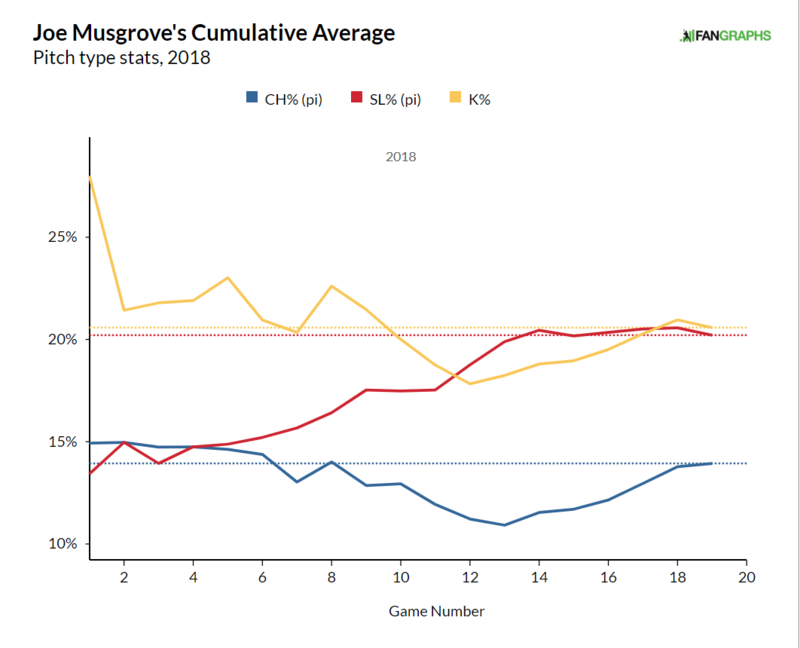 One thing I should note is that FanGraphs considers Musgrove having a curveball along with a slider, whereas Statcast only recognizes a slider, so you can consider the slider percentage column to be the slider column plus the curveball column, as the percentage of curveballs is small enough that it doesn’t skew the overall point of the table. Anyway, looking at this data, you can see that during these best starts by xFIP, Musgrove usually featured a larger mix of his non-fastball pitches and threw his changeup more often than his season average each time except once, and he threw his slider more than his season average each time while throwing less fastballs as a whole, moving away from the cutter in the final three starts in favor of increased changeup use. This combination of good results with a different pitch mix looks to be a good sign for his performance that he hopefully takes into 2019 to at some point become a big part of the Pirates rotation. While Joe Musgrove may seem underwhelming at first glance, going a bit deeper shows that he may have figured something out down the stretch of 2018 and will look to carry that forward into 2019. Musgrove started his year with two perfect innings out of the bullpen against the Reds on March 31, as he may be getting up to speed after his offseason surgery. However, I do believe that if Musgrove continues to switch up his pitch mix, he can push himself into a better tier of pitcher and establish himself as a solid, well-above-average starting pitcher for the Pirates, and we may even look back on this season as his breakout year. We hoped you liked reading Getting Joe Musgrove to the Next Level by Matt Wallach! Is Yoan Moncada’s Breakout Coming? Big Joe went 7 shutout innning with 1BB & 8K’s in his first start. Musgrove wasn’t the only piece in the Cole trade though. Jason Martin is a legit OF prospect and has looked real good in his first few games, SSS aside. Colin Moran will look like a good get if he can hit for more power. I think the trade will end up looking alot better for the Bucs than it initially did when it happened.